A sprouter grow sprouts thats are known to have double the enzymes than what is found in fully grown fruit and vegetables. Enzymes act as a catalyst in different body functions, from extracting protein, vitamins and other building blocks that ensure that your body receives all the nutrients it needs. Sprouts are literally the cheapest way to get maximum nutrients from food. You get to keep healthy on a minimum budget. All you need is a sprouter, seeds and water and there you have it, a continous supply of vitamins, nutrients, enzymes and proteins all year. Even if you do not have green fingers, you can grow sprouts as they basically grow themselves. All you need to do is water them. With sprouting you do not need to till any hard soil, mix compost and whatever else is needed, you don't even need to leave the comfort of being indoors. Sprouts can be grown on your kitchen counter. It does not matter what the seed is, as long as it is organic, it will sprout. This gives you the option to mix different flavours and which always works perfectly for salads, sandwiches and whatever other ways you prefer to eat your sprouts. Eat them as a snack, raw and uncooked. Lightly steam them and add spices of your choice. Sprouts are excellent for stir-fry's. Toss them into your regular salad for that additional nutritional boost. You can add them to your juice or smoothies. Sprouts work very well in rice dishes. Mix into batter for pancakes, waffles or muffins. Blend with other ingredients for dips and spreads. Add to eggs for nutritious omelettes or scrambled eggs. Sprouts taste great in burgers. Sprouts also add lovely texture to homemade patties. For tacos and wraps sprouts are tasty as a topping or filling. 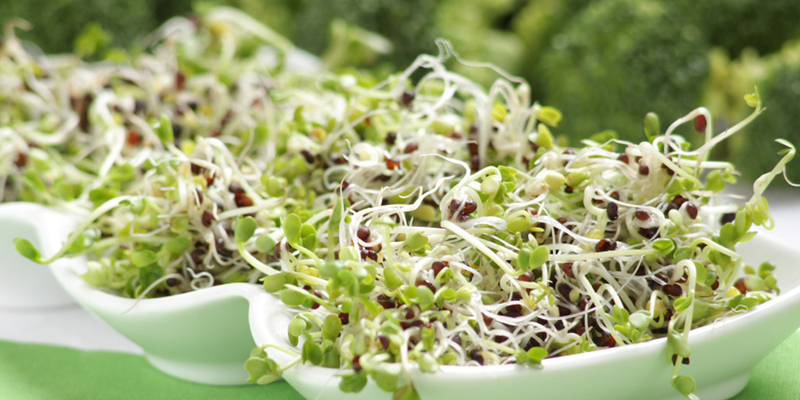 The high number of enzymes in sprouts improve your digestion system. They break down the food and increase the absorption of nutrients as the food moves through the digestive tracts. Plus, sprouts contain dietary fibre which regulates food movement. Dietary fibres are excellent for resolving constipation issues. Sprouts boost your overall metabolism. Protein is necessary for almost all bodily processes, particularly the creation and maintenance of cells, organ repair, skin regeneration, bone growth, muscle development to name a few. This means that sprouts are an easy and delicious way to improve the overall functioning and development of your body. Iron deficiency better known as anaemia is common, especially among vegetarians and vegans. This occurs when you do not consume enough foods rich in iron resulting in fatigue, dizziness and poor oxygen circulation. Seeds like brussel, beetroot and spinach grown in sprouter are very rich in iron. Sprouts are rich in nutrients but low in sugar, cholesterol and calories. You can eat sprouts in large quantities and not worry about weight. Plus due to the nutrition content sprouts keep you satisfied for longer, reducing cravings and overall food consumption. Sprouts provide omega 3 fatty acids, the 'good' cholesterol that the heart needs to function. Omega 3 is also anti-inflammatory, reducing any pressure put on the heart by external factors such as stress and an unhealthy diet. The potassium content of sprouts also aids in reducing blood pressure and increases the circulation of the oxygen in the blood vessels. All these benefits reduce the risk of clots developing in the blood vessels, strokes and heart attacks. The vitamin content in sprouts makes your immune system smile. The Vitamin C fights off diseases while the Vitamin A works as an anti-oxidant which strengthens your immune system against attacks. Having these vitamins helps in preventing diseases like cancer.